As a longstanding bestseller, Ubuntu Linux Toolbox has taught you how to get the most out Ubuntu, the world's most popular Linux distribution. With this anticipated new edition, Christopher Negus returns with a host of new and expanded coverage on tools for managing file systems, ways to connect to networks, techniques for securing Ubuntu systems, and a look at the latest Long Term Support (LTS) release of Ubuntu, all aimed at getting you up and running with Ubuntu Linux quickly. 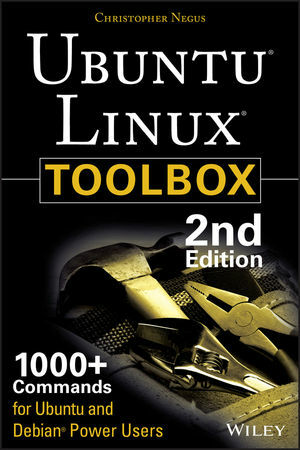 Ubuntu Linux Toolbox, Second Edition prepares you with a host of updated tools for today's environment, as well as expanded coverage on everything you know to confidently start using Ubuntu today. Christopher Negus has more than 25 years of experience teaching and writing about Linux and UNIX. He has authored dozens of books on Linux, including the best-selling Red Hat Linux Bible, Linux Bible, the Linux Toys series, and the Linux Toolbox series.Awards for Christopher's writing include "Best Linux book of the year" for his Red Hat Linux 8 Bible, as voted by readers of Linux World magazine. For the Linux Journal 2009 Readers' Choice Awards, his Linux Bible was voted one of the top five "Favorite Linux Books of All Time."